Most car lovers will agree that there are few cars that can be compared with an Audi. 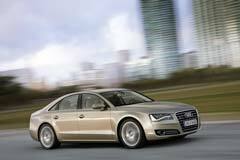 If you are considering buying a used Audi A8, the following information will be very helpful. The Audi A8 is the successor of the Audi V8 and it has been acclaimed as one of the best four-door, luxury sedans from the Audi range. It has been marketed since 1994 and a new face-lifted version was introduced in 2002, and again later in 2009 and 2013. The most popular transmissions were the 4 and 5-speed automatic, but for those who wanted a manual transmission there was also the 5-speed manual version. There is the standard wheelbase version and the long-wheelbase version, also referred to as the A8 L.
The Audi A8 comes with quite a few amenities, including, a wood and leather interior trim, heated seats, dual-zone climate control and an enhanced audio system. The front grill is one of the most eye-catching features of any Audi car. In the later versions the grill was revised and other things were included such as larger headlights, different door handles and side curtain airbags. 2011 A8 QUATTRO 2011 AUDI A8, BLACK with 106048 Miles available now!